In December 2014 Danish scientists exposed religious fraud. 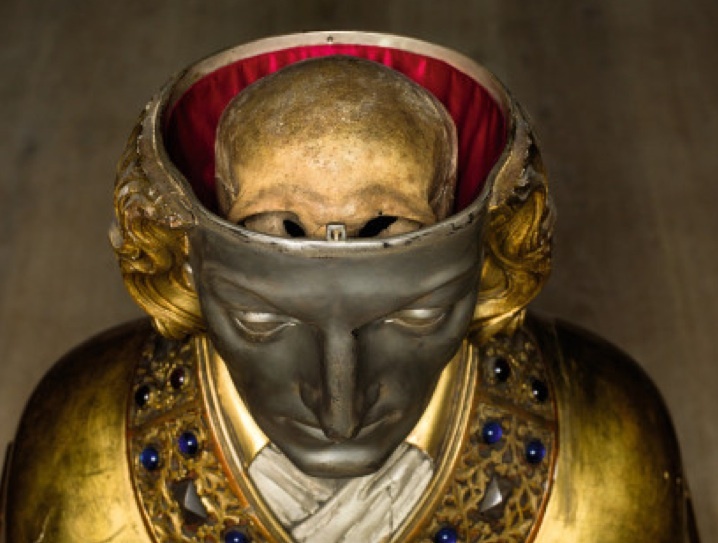 The skull inside the golden head of saint Pope Lucius is not the skull of the Pope. The skull inside the “holy head” of Pope Lucius is not of the Pope. Director Per Kristian Madsen of the Danish National Museum has discovered a case of religious fraud. The skull inside the golden head presented as Pope Lucius the first, is not of the Pope. The dating was carried out by Jan Heinemeier at the Department of Physics,University of Aarhus. The results showed that the skull came from the period AD 340-431, and therefore proved that it did not belong to St. Lucius (died AD254). According to the National Museum director Per Kristian Madsen, one way of solving at least part of the puzzle, is by opening the sarcophagus under the high altar of St. Cecilie Church. Both he and Jette Arneborg have visited the church to see the sarcophagus and hope that opening it will show if the skeleton there lacks a head. It may well prove that the skull from Roskilde once belonged to the skeleton in Rome, and the envoys got what they were led to/or wanted to believe was the head of St. Lucius. A Russian Orthodox priest conduct a mass infront of the ‘Holy head’ on Saint Lucius. 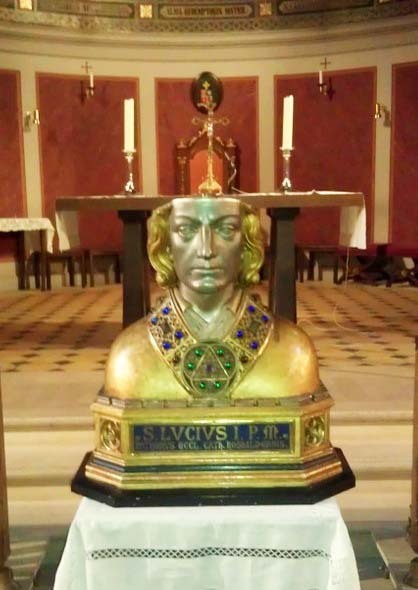 The skull is worshiped by the Russian Orthodox Church in Denmark, who also has Lucius as one of their saints. The worship of the skull is recorded by a blogger. 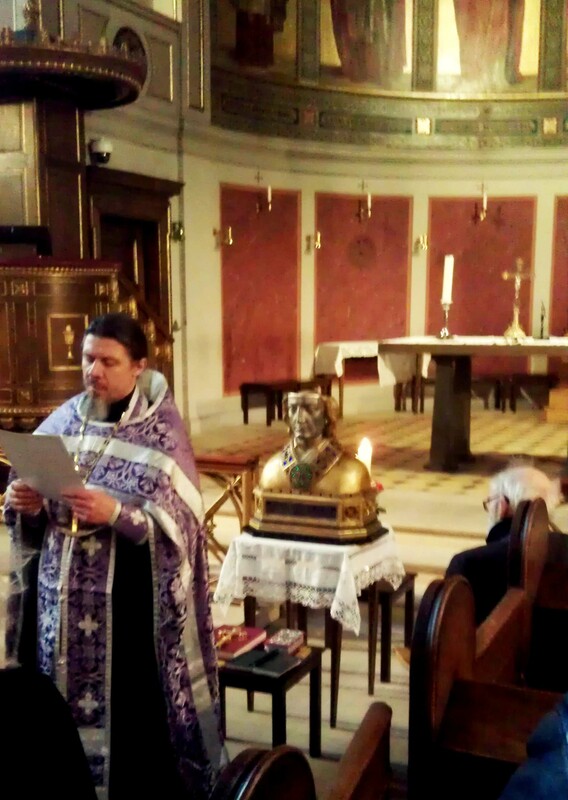 We are happy to inform our readers that on Sunday the 17th of March a public prayer was conducted in front of the relicts of St. Pope Lucius I in St. Ansgar church in Copenhagen. The public prayer was initiated by our society and led by father Sergiy (Bondarev) from the Russian Orthodox church of St. Alexander Nevsky (Moscow Patriarchy). It is the first time Russian orthodox people prayed in front of the relicts of St. Lucius. The old man bow his head before the skull, is an act of worship. This skull is not of Pope Lucius. But an object of fraud and shame. 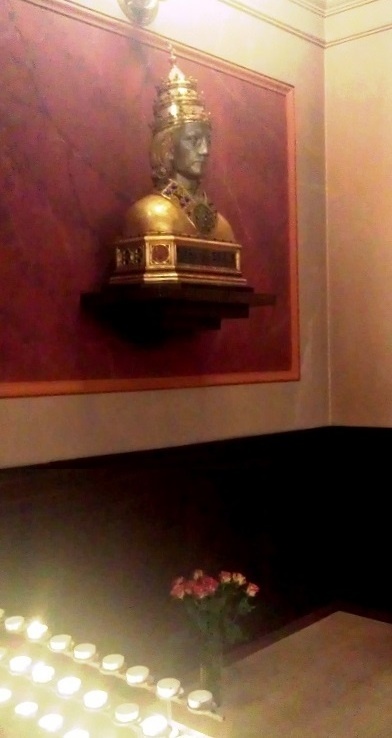 The claimed “holy head: infront of the altar in the Danish Church, owned by the National Museum. Candles and prayer is offered to the “holy head’ of pope Lucius. His papal crown covers the skull. A Danish legend held that the demons of Isefjord feared nothing but the skull of Lucius I, and when this skull was taken to Denmark, it brought peace, and Lucius was declared patron of Zealand. The skull was then preserved as a national relic until carbon dating proved that it did not date back as far as his time. Since the Pope is supposed to be infallible in the process of canonization, how did the Pope miss out on this one? If the skull is not of the Pope Lucius the first, the pontiff in the Roman Catholic Church has canonized and made “holy” the wrong head. It is now left to the Vatican to investigate the matter. It will not be easy to find the correct skeleton, in a bid to identified the person they have beautified and made their “saint”. If this person was not a Christian, the RCC might be praying to a soul that is burning inside the flames of Hell. A demon would not mind entertain such not biblical prayers. 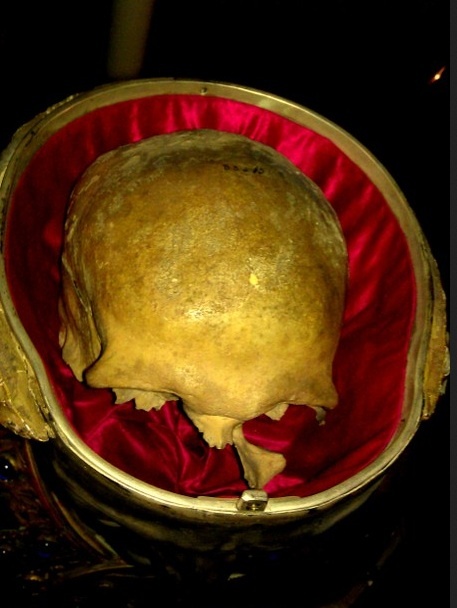 This skull being of a Pope, or not: After seeing these photos you have to be raving mad, or simply a son of the devil, if you continue to claim that the Roman Catholic Church is a Christian Church. Not even pagans are involved is this kind of filthy fraud. What makes this a spiritual disaster of apocalyptic proportions, is the amount of people being deceived. To steal a skull is bad enough. To worship this kind of stuff amount to spiritual insanity. Take a public stand against these kinds of crimes done in the name of “Christ”. You have no shame if you do not renounce this evil. May Jesus the Messiah issue a stern judgment on all who refuse to repent. Amen. Who dreams up the adornments and containers of these bones and body parts? 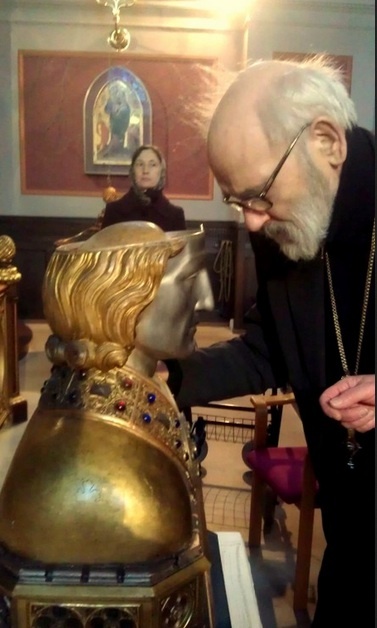 Is there an R & D Department in the Catholic church that’s in charge of relic decoration? And who pays for the expense of the jewels, gold, and “art work? And why? Just asking. It seems like a reasonable question? At least to me. The end is near , and G-d is not mocked. them and anyone who bows to this evil will loose their soul…and G-d says that no one will have an excuse. Just keep praying and speak boldly..which is what the church should do if they are follow the true Messiah. The Catholic Church used to sell indulgences to buy yourself or relatives out of purgatory. At the same time that had the bones of 18 of the 12 Apostles and more which people paid to see. This is part of what Martin Luther campaigned against. So no surprise to me this skull is a fake. Hello everybody. I was born in Italy. Yeah, Roman Catholic. I myself have been teaching Religion and Cathechism to pupils. I studied. And I got rid of everything. Open your eyes, it’s just history, psicology and science! Find something good for your ethics and start living your life happily! Respectful, but can’t keep shut. Why all this… this waging war one against the other? War is against god(s). It’s against well being. It’s against ethics.